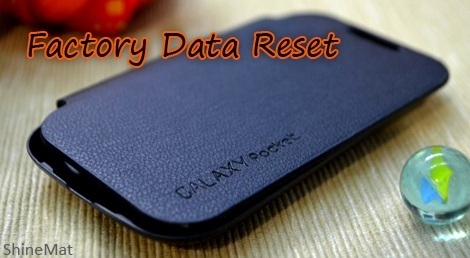 If you are a user of Samsung Galaxy Pocket GT-S5300 android OS based device and you use pattern or character device locking system for security, have you ever think what will happen if you forget your password? Well! I am asking this stupid question because today I got a problem same about this. My aunt's mobile locked by my 4 years younger sister by mistake. Now what? I thought, whole OS flash have to be apply. I searched on internet about this problem and after surfing some troubleshooting forums and blogs I found a hard factory reset system. But one problem is, if you apply this hard reset on your device, it will remove your all personal data (i.e. contacts, messages, notes and calender entries). Anyway, I think its pretty better to reset factory settings rather than whole original OS flash. 3. Open and close your battery for one time. 4. Now press and hold volume up button and home (central big button) button together. 5. Keep holding these above buttons and press the power button for 10 seconds. 6. A recovery menu will be appear. Now release the buttons. 7. Scroll down (use volume + - button) and select reset to factory data by using home button. 8. Your phone will automatically restart and you are all done. If auto restart does not work then select restart phone option. I am sure most of reader may know this trick. Today I am a new learner for this trick so that I can't stay anymore to share with readers of ShineMat. Shout your comments at below. Its 2:44 am here, so good night to you all. Have a nice day buddy!